6 Ultimate ½ pint substrate Jars- Pressure sterilized and ready to grow! 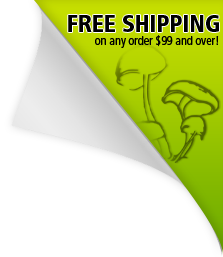 Midwest Grow Kit's Simple Mushroom kit is a great place to start for the budget conscious grower. Our Simple kit is perfect for growing edible and exotic species of mushrooms. We take you through the entire process from start to finish. The PF style substrate jars are specially formulated to grow faster, larger and quicker than any other kit out there! Growing has never been easier! Our Ultimate substrate jars are the quite possibly the best on the net! We have worked for over 10 years looking for perfection! We finally found it! We have combined special organic brown rice flour with vermiculite, mineral water, Liquid worm castings and Bee pollen to create the Ultimate mushroom growing jars! We do not stock pile jars like other sites! We hand make every jar the morning your kit ships so your jars are the freshest possible! They are pressure sterilized in our Autoclave for 120 minutes. Step by step instructions, it's all laid out beautifully. Could include a heating pad and controller, but has all the basics of what you need and if i wanted a more comprehensive kit I would have gone a step up. It was shipped pretty fast, the kit was revised in very good condition , I am satisfied! Extremely happy with my purchase! It was delivered faster than I expected which meant I could start growing my spores right away. All 6 jars are sprouting pins which is beyond anything I had hoped for! I will definitely be purchasing another grow kit in the future! So far it's been a breeze. Directions were well thought out and detailed. Being my first time trying I've done a lot id research. The manual provided was really all that i needed. Very easy to follow. Im in day 4 of my grow and everything seems to be going smoothly.